By the 1940s, the church was thriving and numbered 2400 members, but in the years following World War II, members moved away and dropped to fewer than 100. In 1982, the church, faced with a $9,000 winter heating bill and dwindling membership, the congregation accepted an offer from a developer to convert the church and chapel into luxury apartments. After the 1851 Romanesque-style church was sold, the congregation worshiped in the former Ladies’ Parlor behind the church. 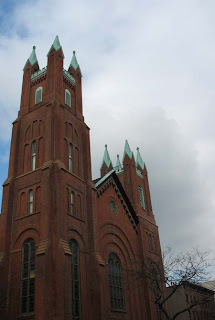 Fortunately, the church complex had just been granted landmark status by the city’s Landmarks Preservation Commission in the spring of 1982, so the church’s exterior could not be architecturally altered. In 1993, the small congregation, lead by Rev. Smith, merged with Plymouth Church in Brooklyn Heights, and in a sad way brought the story of the relationship of South Congregational Church and Plymouth Church to a full circle.